Any rational assessment of the success of the Intrust Bank Arena in downtown Wichita must realize that the arena is in its honeymoon period. Will the parade of big-name stars playing to a packed arena continue for long? Will the Wichita Eagle and local television stations continue to breathlessly announce every upcoming event? Until initial enthusiasm dies down and the arena has a track record of a year or more, we simply have no idea what the financial performance of the arena will be. That’s what’s important. This premature glowing assessment of the arena’s success is dangerous in that it leads us to believe that there is a positive role for large government projects in Wichita. Worse, people are lead to think that taxation is a good way to pay for such things. As an example, the one cent sales tax used to pay for the arena is presently touted as a model for funding other government spending, ranging from Governor Parkinson’s proposal for a sales tax to fund state government to what surely will be a proposal for a sales tax to fund the revitalization of downtown Wichita. But the tax was not painless. Undoubtedly, the employment landscape was shifted in Sedgwick County because of the tax, and that caused some people to be unemployed. My post Prepare for sales tax-induced job effects now reports on what happened in Little Rock when that city’s arena was built. It would be reasonable to think that similar effects happened here. It also concluded that “If those individuals who put their money into baseball via taxes are allowed to put that money into the private market, that same amount of money would actually yield more jobs.” Reportedly, Portland’s mayor “appears to have sat on” the study and was not eager to release it. Therefore for every public job created by the bridge project a private job has been destroyed somewhere else. We can see the men employed on the bridge. We can watch them at work. The employment argument of the government spenders becomes vivid, and probably for most people convincing. But there are other things that we do not see, because, alas, they have never been permitted to come into existence. They are the jobs destroyed by the $1,000,000 taken from the taxpayers. All that has happened, at best, is that there has been a diversion of jobs because of the project. We were also told that the arena would be a driver of downtown development. But in its first test, the Wichita City Council evidently didn’t believe what arena boosters told them, as it voted to grant several million dollars in subsidy to the developer of a hotel just a few blocks from the arena. Will all future development around the arena — if it happens — require similar subsidy? A note to readers: I served as co-manager of Peterjohn’s campaign in 2008. 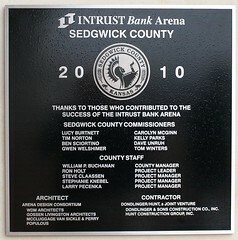 The commemorative plaque on the Intrust Bank Arena in downtown Wichita, Kansas. On the commemorative plaque outside the Intrust Bank Arena in downtown Wichita, there’s a missing name. The names of eight Sedgwick County commissioners appear, including all who were members of the Commission when the arena sales tax passed in November 2004, all who have served since then, and all present commissioners. Except for one: current third district commissioner Karl Peterjohn. It was a gracious gesture. There’s been a small controversy surrounding Peterjohn in his new role as arena supporter. He participated in the arena’s recent ribbon-cutting ceremony. More importantly, he voted last February for a $1.7 million seating upgrade. That upgrade would reduce the cost of transition between events, and also improve seating and viewing. That vote, along with participation in the ribbon-cutting, is central to Peterjohn’s goal of seeing that the arena is a success and doesn’t become a fiscal burden on taxpayers. Although the contract with SMG, the arena’s management firm, shields Sedgwick County from losses, that contract comes to an end someday. It’s also full of loopholes that, in my opinion, would allow SMG to make an early exit if arena finances are not favorable. Working for the success of the arena, therefore, is a logical continuation of Peterjohn’s concern for the taxpayer, the same concern as when he opposed the arena in 2004, he said. There’s also been grumbling that county commissioners and bureaucrats will receive perks such as tickets and premium parking passes to arena events. Peterjohn said he’s received no tickets or parking perks. A Wichita Eagle blog post by Deb Gruver on this topic is Karl Peterjohn’s name not on Intrust Bank Arena sign. At the Intrust Bank Arena in downtown Wichita, some concerts are very popular, which leads to people frustrated at two things: the inability to buy tickets when they go on sale, and then the high prices that ticket scalpers ask for tickets on the aftermarket. I understand the frustration of the stymied ticket buyers. Who wants to pay $300 for a ticket that was sold by the arena’s box office for $50? It would be great if everyone who wanted to attend could do so for $50 — or for $5, for that matter. And that gets to the heart of the problem and why it isn’t likely to be solved: human behavior and economics. As it turns out, scalping is a beneficial economic activity. But even if you don’t believe this, scalping could be avoided if venues like the arena would sell tickets in a different manner. According to Block, scalping requires “a fixed, invariable supply of tickets.” After all , if the supply of tickets was unlimited, everyone could buy all they wanted at list price (the price printed on the ticket, and what the venue sells them for). Also, scalping requires “the ticket price chosen by management be lower than the ‘market clearing price. '” Markets clear when people want to buy the same number of tickets that are for sale. This balance is achieved by allowing the price of the tickets to freely adjust. When the list price of the ticket is less than what some people are willing to pay, that’s when scalpers have an opportunity to earn profits. This points to one way that scalping could be eliminated, if concert promoters wanted to: They could sell tickets like shares of stock or bushels of wheat are sold. These items don’t have a list price. Instead, their price is whatever people are willing to pay. For one thing, lower prices invite a large audience. Long lines of people waiting to enter a theater or ballpark constitutes free publicity. In other words, management forgoes higher prices in order to save money it might have had to spend on advertising. In addition, managers are loath to raise ticket prices — even though they would have little difficulty selling them for a big event or special movie — for fear of a backlash. Many people feel that there is a “fair” price for a movie ticket, and managers are responsive to this feeling. There are several other motivations, less compelling, for keeping prices fixed at below equilibrium levels. Taken together they ensure that this pricing policy — the third condition necessary for scalping — will continue. In other words, better for scalpers to bear the brunt of public ire for setting market-clearing prices. Can you imagine the public backlash at the Intrust Bank Arena and Sedgwick County if ticket prices for very popular concerts were set at market-clearing prices? The chapter goes on to explain the two ways that scarce goods — concert tickets in this care — are rationed: price rationing, and non-price rationing. Price rationing, as you might imagine, relies on the price mechanism to determine a market-clearing price so that supply equals demand. Non-price rationing, on the other hand, relies on something else. Block mentions “first-come, first served” (camping out the night before at the box office window) and favoritism (those connected to or favored in some way by arena management get special privileges) as two methods of non-price rationing. The Intrust Bank Arena has used another method — a lottery — for some concerts. So which is “fair?” Does price rationing favor those with the ability to pay high prices? Certainly scalping makes it easier for rich people to obtain scarce tickets. But Block says that scalping provides entrepreneurial opportunities. Someone with a small amount of capital (just enough to buy one or more tickets) but a lot of spare time (someone without a job) can camp out in line and earn profits by selling the tickets. Or, they could simply wait in line and be paid a wage. By the way, scalpers are not guaranteed profits. If there is not much demand for tickets for an event, scalpers will have to sell the tickets at a loss — or they may not be able to sell them at any price. Back to Wichita: According to a Wichita Eagle article, a group named Taxpayers for Tickets has been formed to take action against scalping. Reading the website, it seems that the group’s focus is on more laws and enforcement of them to effect the goal of getting tickets in the hands of the taxpayers who paid for the construction of the Intrust Bank Arena. I don’t favor this approach. First, as we’ve seen, scalping is a socially beneficial activity that provides market-clearing prices for tickets. Second, there is plenty of actual crime in our community that causes death, injury, and loss of property. We don’t need to squander law enforcement resources on victimless crimes like people willingly and voluntarily engaging in market transactions. In a letter published in the Wichita Eagle, Todd Allen, head of Taxpayers for Tickets, wrote “I figured that since the taxpayers paid for the arena, that makes us the owners.” I hate to disappoint Mr. Allen, but that’s far from the case. Try requesting a contract, as in Sedgwick County keeps lease agreement secret. Not even Sedgwick County Commissioners are able to see the lease of the arena’s flagship tenant. Another article on ticket scalping is Ticket Scalpers Are Hidden Heroes. The Intrust Bank Arena in downtown Wichita has landed NCAA women’s basketball first- and second-round tournament games in 2011. According to Associated Press reporting from earlier this year, “The first two rounds drew an average of 4,100 people.” The Wichita Eagle reports 4,915 averages attendance for all tournament games. Is Presson being reasonable: women’s games, at 4,100 per game, are equivalent to men’s games, which are likely to sell out the arena? It’s his job to promote the arena, but statements like this are not reasonable. The publicly-supported arena in downtown Wichita remains a contentious issue. Comments left to a recent post of mine about the arena provide some insight into the thinking of arena tax supporters. One comment writer said that instead of complaining, I should be supporting the arena. He may have forgotten the extra sales tax that I contributed to pay for the arena. Doesn’t that count? So yes, I do hope that the arena is a success. As someone who is opposed to taxation — that’s why I opposed the arena sales tax ballot measure — I sincerely hope that tax revenues are not required to support the arena. Arena tax supporters have already shown that they’re willing to tax one person to build a playhouse for themselves, so I don’t suspect they’ll be opposed to future tax support of the arena, should it become necessary. The game was held at the Charles Koch arena on the campus of Wichita State University. That arena has a capacity, according to the goshockers website, of 10,400. Wichita downtown arena boosters told voters that if we passed the tax, we’d have lots of events like this, and lots of fans would attend. But in this trial run of big-time professional sports in Wichita, the fans that did attend would fill barely more than half of the new downtown Wichita arena. Arena apologists are likely to come up with a variety of excuses for this embarrassingly poor turnout: It was only an exhibition game. It wasn’t at the downtown arena. It wasn’t the right teams. It was drizzling rain. There will always be excuses. The citizens of Sedgwick County are going to have to hope that the Intrust Bank Arena can do a better job drawing fans. Even though the SMG contract puts that firm on the hook for losses, that contract has a lot of ways for SMG to wiggle out, even before its five year management term expires. Ultimately, it is the Sedgwick County taxpayer who is financially responsible for the arena, and it is they who must hope for success. Currently, Wichita is struggling to find enough parking spots downtown to meet the demand expected to be created by the new Intrust Bank Arena. It’s been a contentious issue, with many Wichitans skeptical of the city’s ability to supply enough parking at prices that people are willing to pay for. But did you know that there is likely to be fewer parking spots in downtown Wichita if the firm likely to lead downtown revitalization planning has its way? I wonder: do city leaders know that their herculean effort to develop more parking downtown is an obstacle to downtown Wichita revitalization? Sedgwick county commissioner Gwen Welshimer files for re-election. Today, Sedgwick County Commissioner Gwen Welshimer filed for re-election to her position as a member of the commission. Her statement is below. Welshimer, a Democrat, is so far the only candidate in that party. There are three Republicans who have either filed or are considering filing. Welshimer campaigned and has voted as a fiscal conservative. I asked her given your fiscal conservatism, how will these Republicans differentiate themselves from you? Welshimer said that she’s not heard their campaign platforms. They are all city people, she said, likely to support funding of downtown Wichita. Responding to my question about the downtown Wichita revitalization planning and the likelihood of a tax to fund it, she said that we’ve given the city a $210 million economic development tool called the downtown Wichita arena. The county has also given many years of property tax incentives, both in the past and in the future. The other 19 cities in the county have not enjoyed this treatment, she said. 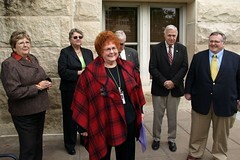 In 2006, Welshimer signed a pledge to not raise taxes if elected, and she has fulfilled that pledge so far. Her opponent in that election, incumbent Ben Sciortino, received the endorsement of the Wichita Eagle. Welshimer narrowly won that election, 10,081 votes to 9,941. Given Welshimer’s fiscal conservatism, Republican candidates will find it difficult to run to her right. Her stand against tax increment financing (TIF) districts and subsidies to downtown developers means she’s not likely to get the support of those downtown developers who thrive on taxpayer subsidy. Those people contribute heavily to political campaigns. Additionally, her support for the dismissal of Sedgwick County Manager Bill Buchanan — a position I support — puts her at odds with the Chamber of Commerce crowd. They make political contributions, too. Considering recent voters (those who voted in an election in 2008), the numbers change a bit. In this case, 30% are Democratic, 44% Republican, and 26% unaffiliated. I have filed as a candidate for re-election to the 5th District Seat on the Sedgwick County Commission. I want to continue holding the line for Sedgwick County taxpayers. At this time, center Downtown redevelopment is the number one issue for this race. I want the tax dollars paid by Southeast Wichita, Derby, and Mulvane to be used for paving roads, drainage, infrastructure, traffic controls, township assistance, and business district enhancements in District #5. The $210 million sales tax arena and decades of property tax incentives for center Downtown have been a weight around the neck of my district. I will support redevelopment of Downtown through private investment only in the future. I want more property tax reduction. I want to pay for it with new revenues and more efficient policies. If re-elected, I will continue to work for safe, sensible, and reasonable alternatives to a costly new jail. The Coliseum site has the potential for 1,000 new jobs and $10 million in new revenue over the next five years. I want to work to make this happen. I want to continue to work for the success of the National Center for Aviation Training at Jabara Airport. This is evolving into a job training destination center for employers around the world and it offers an incredible new future for Sedgwick County. I believe in the power of progressive new ideas. I have not been a commissioner who gives in to the out-of-touch “good old boy” network. I am ready for a rigorous campaign. Two recent events have led me to suspect that as part of the plan for the revitalization of downtown Wichita, we’re going to see a sales tax proposed. The first is Phillip Brownlee’s editorial in last Friday’s Wichita Eagle, which carried the title Taxes are lower than many think. While this editorial focused on property taxes, it’s easy to see this as an argument that Wichitans can bear the burden of more taxation. Softening up the electorate, so to speak. I recently received the attached information on Oklahoma City’s next plan for their downtown area. This is their MAPS program that spurred their downtown developed. I thought you might find this of interest. MAPS — that’s the program that funded Oklahoma City’s downtown improvements through a sales tax, with a second version funding school projects — will be voted on in December. If approved, a 1% sales tax will raise funds for more downtown projects. This email, without saying so directly, endorses the idea of a sales tax for downtown development. What’s the sales tax in Oklahoma City, you may be wondering? It’s 8.375%. It won’t change if the new MAPS plan is approved by the voters, as a current 1% tax will expire. The sales tax for Wichita is 6.3%. City leaders are likely to use the the Intrust Bank Arena in downtown Wichita as an example of a successful project funded through a sales tax. But any assessment of the success of this project is about two years away. The fact that the arena exists is evidence of a minimum level of competence. It will be some time before we know whether the arena can support itself without being a drain on taxpayers, despite the provisions of the SMG management contract. In Wichita, we’re going to have to be watchful. The drumbeats of new taxation have started. In 2004, as residents of Sedgwick County were considering whether to vote for a sales tax to fund the downtown Wichita arena (now known as the Intrust Bank Arena and nearly ready to open), people wondered about parking. Today, on the eve of the arena’s opening, these parking garages don’t exist. What about surface parking spaces? According to the draft version of the parking plan submitted to the city council last week, there is “available weekday parking supply at peak of approximately 3,040 spaces within the Arena District.” That district is, approximately, a three-block radius around the arena. The parking structures promised by arena boosters might be built. The city has approved a TIF district that surrounds the arena, and there is the potential, by my reckoning, to spend around $9 million on parking structures. But at a cost of $20,000 to $25,000 per space, this money buys 450 parking spots at most. By the way, I learned that the number of parking spaces around the arena is likely to decrease. At least that’s the goal of one of the firms who pitched their planning services to Wichita last week. That’s because if there is development of the area immediately surrounding the arena, there won’t be room for so much parking. Travel by automobile is something to be reduced, according to most of the planners, and we should rely on transit and bicycles instead. I realize that the arena boosters who put out this information weren’t government officials (although some may have been involved). They put out a few other whoppers, too. It’s too bad that so many citizens believed them. This proposal is available because I requested it (and paid for it) under the provisions of the Kansas Open Records Act. The Wichita Eagle requested it too, and as of the time I received my copy, only that newspaper and I had requested it (along with the other three proposals from the finalists). Goody Clancy Proposal for Downtown Wichita Revitalization Master Plan to view or print the document. There are danger signs all over this document. Under the heading “Fiscal Responsibility,” for example, we see “Know the full range of effective public-private finance tools at hand.” Which means, of course, that developers will have their hands in the pockets of taxpayers through devices such as TIF districts, grants, tax credits, abatements, and other forms of subsidy. What’s wrong with this statement? First, inexpensive land is a good thing. It means more people can afford what they want. Second, note that people developing on the perimeter pay their own infrastructure costs. This statement hints that downtown developments won’t be expected to pay theirs. It’s unknown how seriously the city council will take the steering committee’s recommendation. The council plans to vote on October 13. The following is a lightly edited version of an insightful comment left on this site by an unknown writer, the “Wichitator.” Since many readers don’t read comments, I’ve promoted this to a post. Hundreds of millions have already been spent for downtown redevelopment and what do we have to show for it? In contrast, look at the benign neglect the city has had on the thriving east and west sides of town where projects on Maize and Webb roads have prospered despite heavy property taxes. Over 20 years ago the current downtown developer of the languishing East Bank (WaterWalk) project, Jack DeBoer, provided his vision for revitalizing downtown. There was a lot of public discussion about DeBoer’s proposal including front page Wichita Eagle articles at that time. No one in the local news media wants to talk about this now apparently. Ironically enough, at that time, DeBoer’s plan did not include the struggling East Bank (Waterwalk) project that he is currently involved in. DeBoer’s vision of downtown projects were largely implemented by taxpayers over time. The largest and most expensive of these projects will be the Intrust Arena with its $200+ million price tag. The only one that has been partially rejected was turning the Keeper of the Plains into a 500 foot community version of a Seattle Sky Needle that one might argue was at least partially implemented when this statue was placed on a much higher pedestal at a more prominent point where the two rivers meet at high cost to city taxpayers. Lesser downtown projects that were part of DeBoer’s plan and were a lot less expensive than the new arena, were completed years ago. This public infrastructure is now in place at a very expensive cost to taxpayers of the past few decades. Another example, Exploration Place, still has years before its mortgage will be paid off, I believe. Where has been the return for this community? It is invisible to this taxpayer. Look at the downtown taxing district. It takes in about the same level of property tax revenues as it has always received. It is clear that there is no private sector growth downtown. So tax revenues are stagnant. This publicly funded but privately selected downtown board operates with almost no media oversight. There is some taxpayer subsidized remodeling going on but outside of that, I can only think of the Garvey Center where significant private funds are being spent on a partial remodel of their downtown property. The philosopher George Santayana said, “Those who do not remember the past are condemned to repeat it.” Since the downtown development plans are NOT being made public it looks like we’ll soon have another, 21st century version of the 1980s DeBoer plan that the taxpayers in our community will be expected to fund. In Washington, nothing fails like excess (see GSE’s Fannie & Freddie) and in Wichita we are trying to follow in our federal masters’ footsteps. Since local government can’t print money like the political fools in Washington can through the Federal Reserve Bank, the fiscal chickens will come home to roost a lot more quickly here. Mr. Weeks is right in trying to see the details of these proposals. If we did, the price tag would probably take our collective breaths away. The downtown development folks who want to be the 21st century reincarnation of Mr. DeBoer are just as right in wanting to keep this information hidden. A recent letter in the Wichita Eagle by Alden Wilner of Bel Aire worries that “flat, dusty and hot” parking lots in the neighborhood of the Intrust Bank Arena (formerly known as the downtown Wichita arena) in downtown Wichita will hamper downtown revitalization. I don’t know if this claim is true or not, but I do know that the solution Wilner proposes — “an area wide light-rail system” — would be an absolute disaster for Wichita. These systems are costly to build and operate, suffer from low ridership almost everywhere they are built, and have many other problems. The average mile of light-rail line costs two to five times as much as an urban freeway lane-mile. Yet in 2007 the average light-rail line carried less than one-seventh as many people as the average freeway lane-mile in cities with light rail. Do the math: Light rail costs 14 to 35 times as much to move people as highways. The Government Accountability Office found that bus-rapid transit—frequent buses with limited stops—provided faster, better service at 2 percent of the capital cost and lower operating costs than light rail. Light rail is the mantra of those who hate cars. They must love waste and failure in its place. Portland is an example of an area that’s built a lot of light rail in recent years. O’Toole points out that in 1980 — before the light rail building boom — 9.8 percent of the region’s commuters took transit to work. Now that number, despite the light rail building boom, has declined to 7.6 percent. Another article by O’Toole (Light Rail Doesn’t Work) tells of the huge costs, inconvenience, congestion, misallocation of economic development, and increased energy consumption and greenhouse gas output that light rail projects produce. O’Toole is the author of The Best-Laid Plans: How Government Planning Harms Your Quality of Life, Your Pocketbook, and Your Future. As Wichita prepares to undertake large-scale planning for the revitalization of downtown, I would urge our leaders to read this book. This week the Wichita Eagle printed a letter submitted by Sedgwick County Commissioner Karl Peterjohn. The printed letter is quite a bit shorter than what Peterjohn submitted. The unabridged letter follows. The Wichita Eagle editorial written by Rhonda Holman on June 29, 2009 now claims that the new Intrust Bank Arena in downtown Wichita lacks adequate parking. This is a major change by the Eagle editorial board’s position. I have repeatedly asked county staff about the available parking in and around this soon-to-open facility since I became a commissioner in January. I have been repeatedly told by county staff that adequate parking will be available when the Intrust Arena opens next year. The most recent public assurance I have received was only a few days ago. In 2004, while I led the opposition to the proposed downtown arena in my role as the executive director of the Kansas Taxpayers Network, I repeatedly raised the parking availability issue. In 2004 the arena advocates claimed that arena parking would not become a problem and that the critics were wrong. Voters were repeatedly assured that there was plenty of parking that would be available downtown for the arena. The Wichita Eagle editorial page was among the leading advocates for this project and ignored opponents arguments concerning this $206 million (back then it was described as a $185 million) project. At that time there was only a general area for this new facility’s location so this argument lacked specificity. The exact location was unknown when voters cast their ballots. The Friday before the 2004 election I held a news conference pointing out the dimensions of the parking problem downtown in particular and the related location and capacity issues in great detail. At this news conference I provided a map of the Kansas Coliseum’s Britt Brown Arena and adjacent parking area available for comparison purposes with the existing 3,500 parking spaces for this 12,000 seat facility along I-135. I still have a few extra copies of this Britt Brown Arena aerial view. Arena proponents attended this 2004 news conference and claimed that the arena opponents concerns were invalid because of existing downtown parking. The Eagle editorial page repeatedly backed these arena proponents’ claims. The 2004 election is now political history. I want the Intrust Arena to be a success because this project has now become very important to the entire community. The reservations I expressed in 2004 have not disappeared just because of time. The decision to eliminate some of the one-way streets with two-way streets will not be an improvement in traffic flow in my opinion. There will be challenges for people to become comfortable with access into and out of this new facility while participating in high attendance events when the arena opens in a few months. To get beyond this challenge for any new facility, the county staff and parking consultant need to be correct about the adequacy of parking for the Intrust Arena and I believe are working to accomplish this objective. Kansas City’s Sprint Center (that’s their new downtown arena) is suffering from underuse. Who paid for the arena? As the snippit above approvingly states, someone else besides the people of Kansas City did. $222 million from hotel and car-rental taxes funded the arena. In Wichita, the Intrust Bank Arena (formerly known as the downtown Wichita arena), set to open next year, was paid for largely by its own hometown, as it was funded through a sales tax. The Wichita arena, unlike Kansas City’s, has a tenant, a minor league hockey team. Even though the arena is owned by the citizens of Sedgwick County, details are kept secret from the people. A letter in today’s Wichita Eagle places a lot of faith on things not yet seen, and in things we know don’t work. First, since the Intrust Bank Arena is not yet open, it has no track record. We have absolutely no idea how well it will do, financially or otherwise. A lot of people think it’s “dumb” to count chickens before eggs have hatched. To believe that paying taxes to the government is good requires believing that government spends wisely. There’s little evidence of that. Perhaps the writer means that when tourists from out of town travel to Wichita and spend money, our local government will be gathering tax revenue from out of our area. Better to tax someone else than ourselves — that’s the underlying message. These taxes serve to suppress travel to cities that levy them. How does it feel to have a city add 13% to the cost of your hotel room, as I have paid in some cities? Or how do you think travelers feel when a city levies fees and charges that add 26% to the cost of renting a car, as some places do? Since demand falls with rising prices, these high taxes reduce demand for travel to high-tax cities. Probably worse than that, they leave a bitter aftertaste for those who pay them. Do we want travelers to Wichita to feel that they’ve been soaked by our local taxes? They won’t feel good about coming back again. Sedgwick County, owner of the Intrust Bank Arena (the downtown Wichita arena), has a five-year contract with SMG that outsources the management of the arena. Yesterday, SMG announced a 10.5 year lease with the Wichita Thunder hockey team. Terms of the deal weren’t disclosed, and SMG is resisting their release, as explained in Wichita Eagle reporting referred to in my post Wichita downtown arena open records failure. But this much is clear: SMG has committed to a contract that lasts longer than their contract with the county. Sedgwick County could choose to renew SMG’s contract, of course. The contract also contains a provision where if the county receives at least $1,700,000 from the profit sharing agreement with SMG, the contract automatically renews. But it seems like SMG is getting a little ahead of itself. It also appears that the lease contract SMG made with the Thunder requires approval by Sedgwick County. So it seems that this contract, extending beyond the management term as it does, is subject to Sedgwick County approval. The Thunder is certainly a major revenue stream for the arena. In fact, they’re the anchor tenant. The lease, at 10.5 years, is much longer than the one year mentioned. So there’s another clause of the contract that seems to indicate that Sedgwick County has approval rights for this lease agreement. Here’s a question: can Sedgwick County give its approval to a contract that SMG will not let the county see? Yesterday, the company that manages the Intrust Bank Arena (the downtown Wichita arena) announced a lease with the arena’s flagship tenant, the Wichita Thunder hockey team. But we don’t know the details of the lease. Unbelievably, some Sedgwick County Commissioners and managers are okay with that. The Wichita Eagle article Details of Intrust Bank Arena contract with Thunder are a secret reports the details. I believe the exception is meant to prevent a company who, say, sells pencils to the county from being subject to KORA. But the relationship between SMG and the county is different. Sedgwick County has outsourced the management of the arena to SMG. The county is paying SMG, too. According to the contract, $8,000 per month at this time. The county and SMG have a broad nondisclosure agreement in their contract, although this can’t override the KORA. Besides the legalities of this, SMG and Sedgwick County need to find a way where this lease agreement can be made available to the public. I recently obtained a copy of the existing lease agreement between the Thunder and the county in anticipation of comparing it with the new agreement, the one shrouded in secrecy. If SMG decides to keep this contract secret, it will be a public relations disaster for them. It’s also a strike against the Sedgwick County managers who negotiated the contract with SMG that contains this provision, and against the commissioners who voted for it. Sedgwick County Commissioner Tim Norton seems to be the prime apologist for the secret contract. Let’s hope that SMG changes their mind soon and releases the contract.